This Pistachio Pesto & Asparagus Flatbread Pizza couldn’t be easier to make. Layers of homemade toasted pistachio pesto, fresh mozzarella cheese, and roasted asparagus create a deliciously easy spring meal. Spring is finally in the air. Can you feel it, or is it still snowing where you live? For your sake, I hope it’s not. I’m so over the snow. I’m ready to unpack my summer wardrobe. Now that it’s warming up, it’s time to start whipping up easy meals made with bright, vibrant, fresh ingredients. I like to keep things simple–simple ingredients, simple execution. That’s my motto during the spring and summer months. I like to let fresh ingredients speak for themselves. A little nudge is all they need. The pistachio pesto is a perfect example. I toasted Diamond Pistachios until fragrant and nutty and blended them with fresh basil, garlic, lemon zest, Parmesan cheese, and olive oil. Six simple ingredients. Big flavor. When the days start to get longer, and the air becomes warmer, I’d much rather spend my time enjoying the outdoors, so I took some help from the store and picked up a package of pre-made flatbread (no shame). 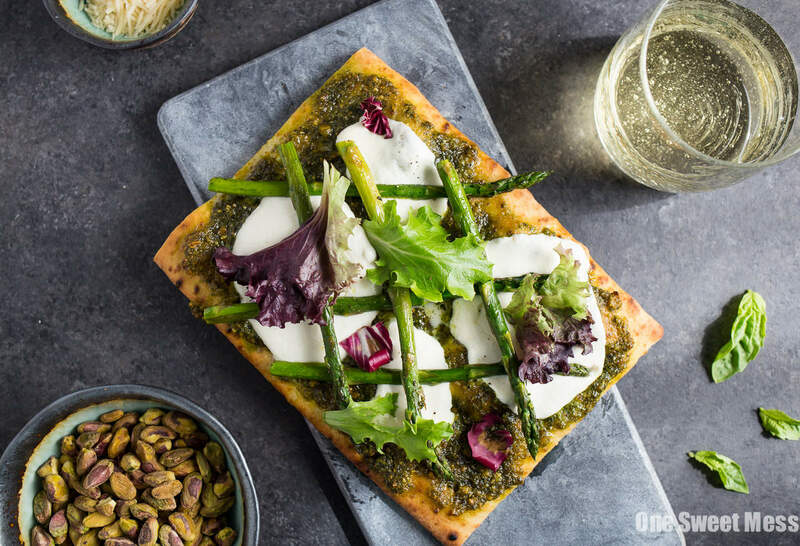 You’re guests will be so focused on the delicious pistachio pesto, that they’ll never even give the store-bought flatbread a second thought. The great thing about this recipe is that it can be made in the oven or on the grill. If you’re like me and hate to turn on the oven in the summer, then you can grill the asparagus rather than roast it and place the the assembled flatbread pizza on the flameless side of the grill to bake. I love versatile recipes! Did I mention no sharing? Each person gets their own individual flatbread pizza, so there’s no need to fight over the last slice. The crunchy pizza layered with the fresh and vibrant pistachio pesto, creamy mozzarella cheese, and crispy roasted asparagus is guaranteed to become a spring and summer favorite. Place the asparagus on the cookie sheet. Drizzle with olive oil and add a generous pinch of salt and pepper. Roast for 10-15 minutes, or until tender. While the asparagus roasts, make the pesto by adding all of the pesto ingredients to the bowl of a food processor. Pulse until smooth. Season with salt and pepper to taste. Place the flatbread on a baking sheet. Spread an even layer of pesto on each piece. Top with 4 slices of mozzarella and 4-5 pieces of roasted asparagus. Place the pan in the oven and bake until the mozzarella is melted, about 10-12 minutes. Remove from the oven and top each flatbread pizza with a handful of baby arugula. Slice and serve immediately. Disclosure: This was a sponsored post written by me on behalf of Diamond of California. All opinions are 100% my own. This is the ultimate spring masterpiece!! I could go for this right now! Oh, Jennie this pizza is stunning and looks like a work of art! I’ve never made a pesto with pistachios, but I love them so I’ll have to try it. Thanks for such a great recipe! Oh I love pesto and love how this flatbread scream spring time. This is beyond gorgeous! Loving all the flavors! I am adding this to my list to try soon! Amazing spring flavors! The perfect pizza for spring! i love this! I’ve been obsessing over asparagus lately, and the pistachio add is perfect here! I love the color and flavor of them with spring veg. Mmm, someone should open a flatbread pizza franchise, I’d go.